So I am starting work on the redesign of “Housewar”, the decline & fall of the Galactic Empire boardgame I usually play each Christmas. You win if you get the most Glory. The exception to this: the player with the most Blame loses, regardless of their Glory score. So while players will try and score Glory, they are also trying to shift blame away from themselves and onto the other players. Past versions of the game have failed to balance event cards. So I am trying a new track. Each turn a player can draw five conspiracy cards, representing plots they can start against other players. Each plot has two different triggers. 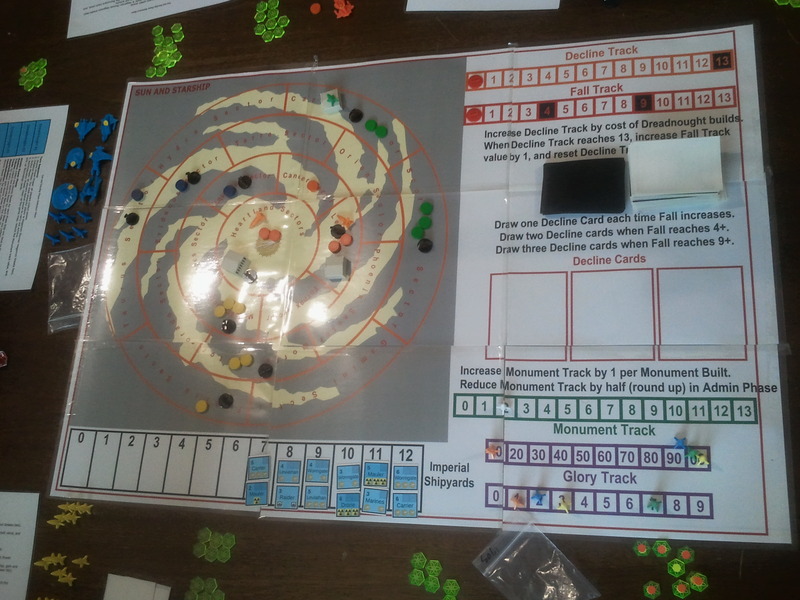 When the target player does either of the triggers, the plotter can reveal the conspiracy and make a die roll to see if the plot succeeds. There may be a bit of a tradeoff here, between the small easy to get benefit, and the bigger, harder to get benefit. Rather than have a lot of different cards, I am going for six types of cards, nine versions of each, with three of each flavour (elite, popular and military). Part of what I am looking for here, is more direct interaction between players that involves contingent events, and the anticipation of something happening in the future. Some restrictions here: you can start one plot per turn against other players, and you can have a maximum of five plots started against you. 1. Each player places one blame in front of them each game turn. 2. Each player can move half of the blame in front of another player once each game turn. Because you cannot move it away from yourself, there are diplomatic oportunities here to form reciprocal arrangements with other players, or to agree to shift all the blame towards a particular player. C. The Emperor does not get any blame pinned. D. The remaining players pin half (round up) of their Blame. Working to avoid the yo-yo oscillations of last year, the confidence tracks will be much more negative sum. Initial confidence value will be 6+ Emperor attribute value (1-6), so a 7-12 range. However, with each Civil War, the maximum confidence value will be reduced by one. So the interval between Civil Wars should reduce as the game plays on. In the Emperor’s turn, they increase a confidence value by one. All other players reduce a confidence value by one. All players gain power tokens and a side benefit from adjusting a confidence track. Military: gain some fleet tokens. Players could run one track down to quickly trigger the next civil war, however, players who defect from this co-operative strategy will gain more power. One problem in past Housewar games has been a large degree of variability in glory scored between players. So in this version all players get at least one opportunity to score glory each turn. 1. The Emperor gets to reign, and score 1-6 glory and possibly generate some power. 2. Non-Emperors get to indulge in decadence, where they score Glory based on the number of blame markers in front of them. 3. Some conspiracies, when triggered, allow a player to score one point of glory. The sweet spot is for incoming total glory to be just above incoming blame. Not too much to change here, the system worked reasonably well last year, so just some fine tuning. I’m keeping the requirement to spend power or hold the capital each turn in order to prevent your claimant being killed. I am adding a power gain at the end of the war based on territorial control. I am dithering between having specific House units, or just having Imperial units with markers to indicate control. The latter probably means less counters overall. The former makes it much easier to tell at a glance who controls what on the map. Rather than having a lot of fleet counters, with high value fleets degrading into low value fleets over time, I think I can get away with around 40 fleet units. Possibly discard one at random from the game after every Civil War. I am thinking of having House specific leaders (again for the ease of seeing who controls them). I am also considering permanent removal from the game, if killed in combat (about a 7% chance per battle) or if they become Emperor. This means a player who is Emperor a lot early on, may hurt in the end-game if all their good leaders are gone. 13 leaders per player should be enough. So far, I have managed to keep the rules at four pages in length. I really miss having my own printer, it was much easier to generate playtest components with one at home.